The idiocy of Joe Biden is beyond imagination. 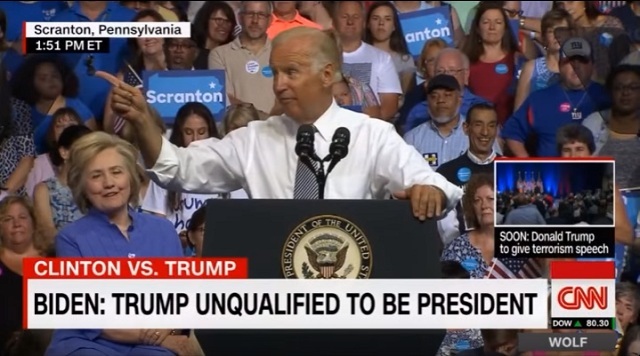 While speaking at a Hillary Clinton rally, Joe Biden said Donald Trump "cannot be trusted" to have the nuclear codes because he lacks "judgement." He then proceeded to go off script and expose an agent in his entourage who was apparently given the nuclear codes. "There's a guy that follows me, right back here, has the nuclear codes," Biden said, pointing to the agent's location. "So, God forbid anything happen to the president and I had to make a decision -- the codes are with me." "He is not qualified," Biden said, referring to Trump, "to know the code." This insane gaffe and national security blunder didn't even merit mentioning in headlines on CNN, ABC News or most of the leftist establishment media who instead chose to simple echo the Clinton surrogate's propaganda. ABC News, who went out of their way to make a stupid meme out of one of his quotes, didn't even mention Biden's gaffe in their article. 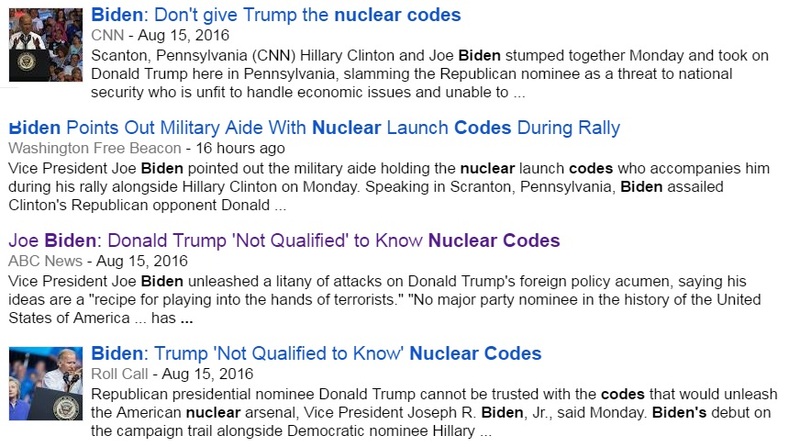 Joe Biden is not qualified to have the nuclear codes. He needs to be stripped of the power immediately.